Creamy mushroom sauce made with both wild, dried porcini mushrooms and your choice of fresh mushrooms, all of which in wine and cream base. This makes for an irresistible sauce that can be added to any pasta dish, chicken, steak, or eaten on its own with a slice of fresh bread. Have you heard about mushroom picking? It ‘s super popular in Europe. In the fall we would all get up at the down and go to the forest to pick up fresh, wild mushrooms. Sometimes it would be a competition among the family members…who would find more mushrooms? However, forests were full of poisonous mushrooms so there always had to be someone in a crowd (ie, a parent) who was a real specialist in edible mushrooms. Every family had at least one member who was really good at identifying mushrooms. That’s how deep this tradition was incorporated into families’ lives. I personally couldn’t wait for the fall to get out into that crisp autumn air and go mushroom picking. Aside from the adventure of it all, the best part was that after we came back home we would enjoy the most delicious creamy mushroom sauce. I grew up in Poland and we have plenty of mushrooms called ‘Bolete’ in our forests (which I have never seen in the US). But there were also plenty of porcinis and chanterelles. We would use these boletes and porcini for an easy wild mushroom sauce, or we would dry them to use later on for Christmas for pierogi, uszka, kapusta or bigos. Chantarelles were separated. We could make the creamy mushroom sauce just from the chanterelle, or use them in pierogi or scrambled eggs. Because it is not very easy to find fresh bolete or porcini in the U.S. you can substitute any variety of fancy mushrooms. 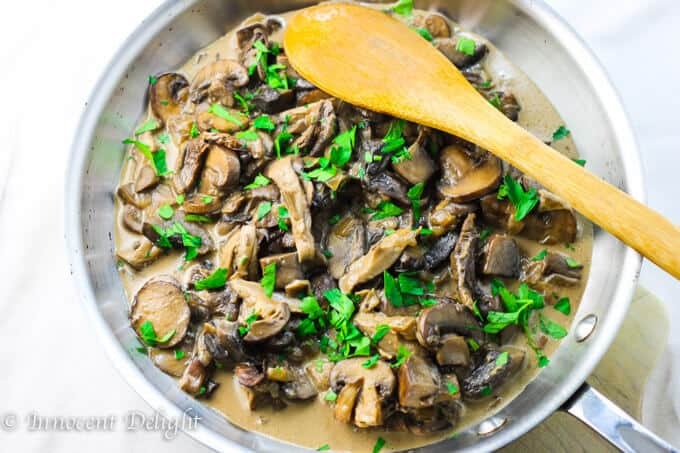 I’ve seen fresh porcini mushrooms in high-end grocery stores, so if you happen to have them then you can make a porcini mushroom sauce, but it’s optional. Or you can use dried porcini mushrooms with some other kinds of easily found mushroom, like shitake, portabello or crimini (that’s what I did in this recipe). 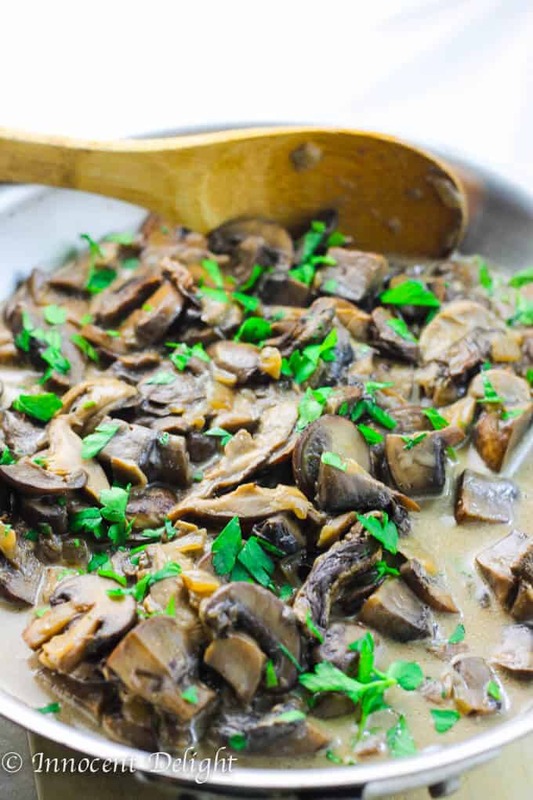 Scroll down for a full printable creamy mushroom sauce recipe. This is a very easy recipe. The only thing to keep in mind is that if you do use dry mushrooms you’ll need to factor in a bit more time. First, the dry mushrooms should soak for about 15 minutes beforehand, and then they’ll have to cook for about 45 minutes. (do not discard the water). Other than that, this recipe is quick and easy. In the saucepan you’ll sauté the onions and then add mushrooms from the meatiest ones to the softest ones: Portobello first and cook for about 5 minutes, then crimini (or Baby Bella) and cook for another 3-4 minutes and lastly the shitake with dry mushrooms and cook for a few more minutes. 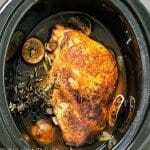 Then add wine and let it cook for a couple of minutes until almost fully absorbed. Lastly, add creme fresh and cook for one minute. 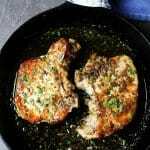 Season with salt and pepper and sprinkle with parsley and you are ready to serve. 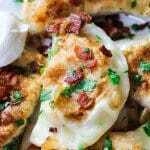 On top of stuffed cabbage – In Poland, people often serve stuffed cabbage with mushroom sauce instead of tomato sauce (it is so good!). 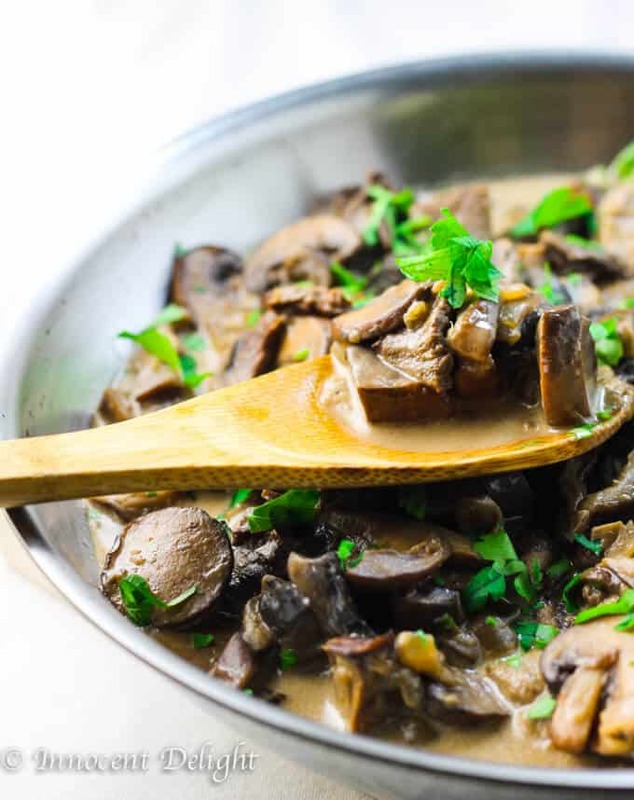 The creamy mushroom sauce made with both wild, dried porcini mushrooms and your choice of fresh mushrooms, all of which in wine and cream base. This makes for an irresistible sauce that can be added to any pasta dish, chicken, steak, or eaten on its own with a slice of fresh bread. Add creme fresh and parley and serve immediately. This post was originally published on March 15, 2015, and since was updated to provide additional information. This mushroom sauce looks seriously TOO good.. I love that you used creme fraiche and a variety of mushrooms. Beautiful! Homemade mushroom sauces always taste so much fresher and better than store bought. Will have to try this! Omg I love mushrooms sooo much but it had literally never occurred to me to make a sauce out of them! It seems like there are so many possibilities here. Makes me want to run to the store and see what varieties of mushroom I can find. I just love all those mushrooms! This sauce sounds absolutely perfect paired with pasta. Yum! This looks like a super flavorful sauce. I would have thought of using it with chicken or pasta, but not over potatoes as you suggested. I love that idea! And how good would this be over steak. Yum! What a flashback of the days randomly picking mushrooms with family, yes I’ve experienced it as well! 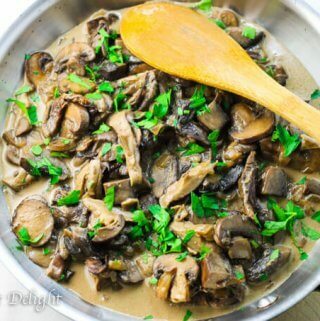 Loving the varieties of mushrooms you’ve used Edyta! W omlecie byłby ten sos super!